My, What A Big Buddha You Have! 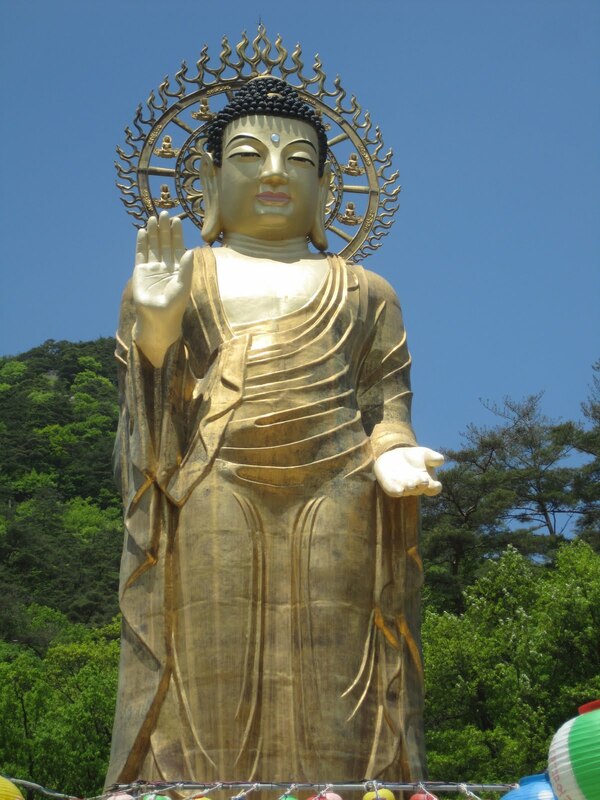 Today in Korea is Buddha’s Birthday, so I went with the Kim family to the Beopjusa Temple Grounds at Songni Mountain and I saw a really big Buddha. The Buddha stands at 33 meters high (108 Feet). There were hundreds of people there who went to pray to their Buddha and visit with fellow Buddhist friends. I did not climb the mountain today (the walk alone is over 3 hours), but I plan to climb it before I leave Korea. The weather was beautiful and I got to take some amazing photographs (which can be found above and below this post.) For more information on the history and information of the Beopjusa Temple Grounds, click here. 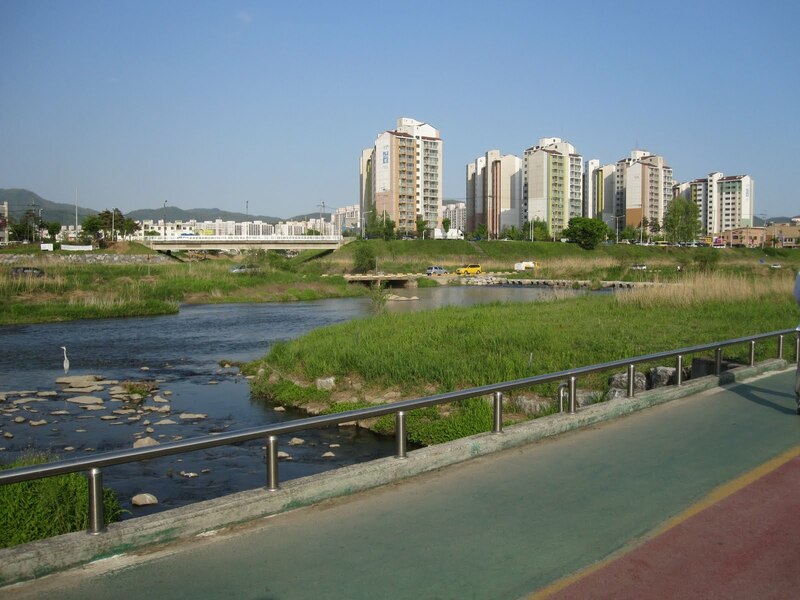 This afternoon after I got off of work I went bike riding along the Musimcheon River with my friend Jaehoon. It was a beautiful spring day, the weather was warm, it was quiet by the stream and there were not many people around. The best thing about the bike riding is that renting the bikes was FREE!! 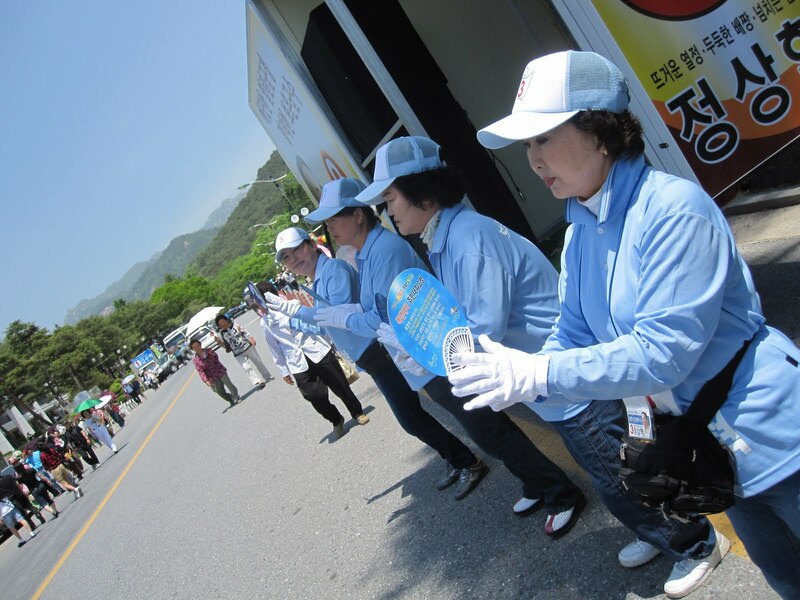 For people living in/traveling to Cheongju, there is a bluish-green shed near the Flower Bridge (꽃 다리) where you can rent the bikes. All you need to do is give them your ID in order to rent the bike and it is your to enjoy. The view is beautiful and not very crowded so go enjoy yourselves and happy biking! 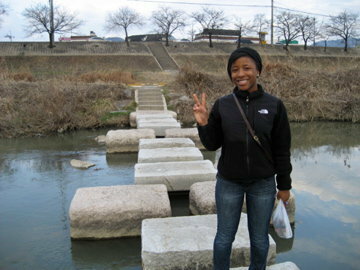 This was one of the best weekends I have had in Korea since I have been here. 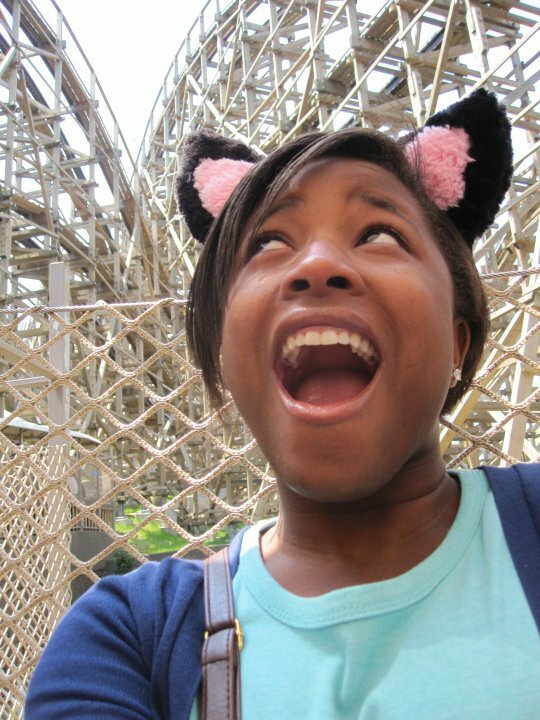 On Saturday I went to Everland and rode the steepest roller coaster in the world called the T Express ! It was amazing!! The tulip festival is also currently going on at Everland and the display was amazing and beautiful. We had perfect weather for the trip and I was surprised at how family oriented the park was; I am pretty sure there were more children than adults there! 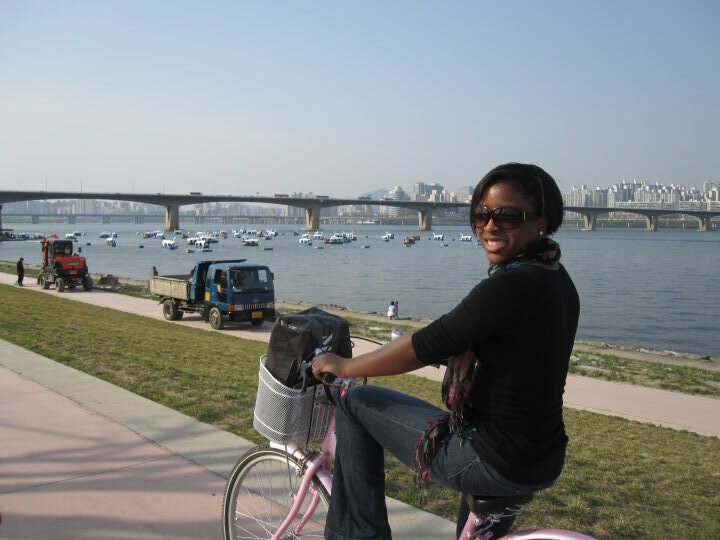 On Sunday I went bike riding at Yeouido Hangang Park in Seoul and rode along the Han River for two hours. It was yet another beautiful day and hundreds of people were outside enjoying the sun and friends and family. 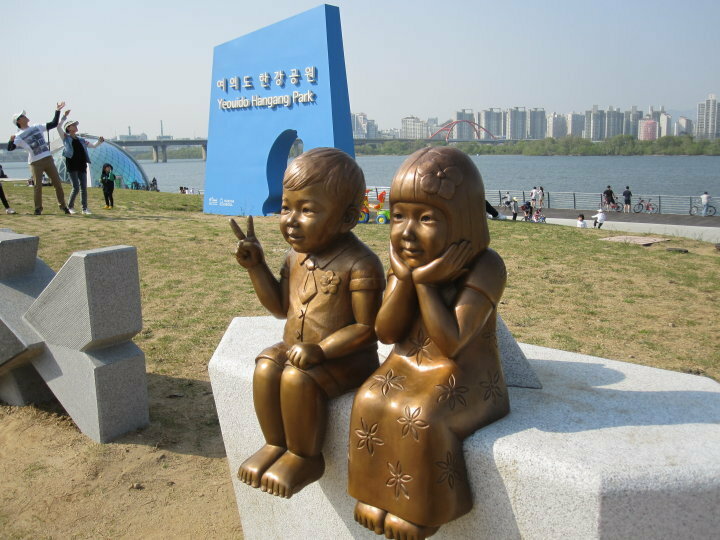 I would recommend that if you go to the Seoul area, definitely go to both Everland and to the Yeouido Hangang Park. You will have an amazing time! 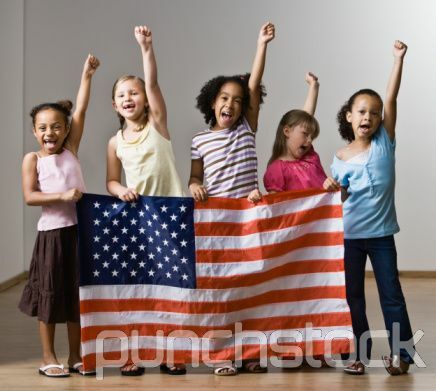 Teacher, I Thought Everyone In America Was White! So today began my first official day of teaching and I thought a good way to start off the year would be to let the children get to know about me, my family, and my home. I then thought it would be a good idea to get to know a little bit about them, and then have them ask me any question that they wanted to ask and I would answer, no matter what. S: Teacher, are you married? S: Teacher, do you live alone in Korea? S: Teacher, I thought everyone in America was white! The last was clearly not a question. I had to explain that the United States is a big mixture of people, white, brown (“like me” I said), Chinese, Spanish, Japanese, Korean, Indian…. They were very suprised. I think I have to find a multicultural movie for my classes so they can see that America is full of many different nationalities. Most of the classes went on in this way. The boys were definitely the more vocal students in the classes while the girls were more shy and reserved. In one of my sixth grade classes, one boy with dyed hair asked me what dong (area) I lived in and I told him. He then proceeded to tell me that he lived in the same area. He then asked for my address and I laughed. My co-teacher Monica told him that he could not have my address and he certainly could not go knocking on my door. My co-teacher was so helpful today and now I understand the need for co-teaching in a Korean classroom. She had to assist me with language difficulties between me and the children since a lot of the things I said they did not understand or needed clarification for. The main difficulty in my classroom is that students are at many different levels. Some students are at the correct English level for their age while others are struggling severely with learning the language. Tomorrow is teast day at my school so no classes! I Jumped Across The River and I Didn’t Fall In! My first home-made Korean dinner at Kim Jong Soo’s house was delicious. Mr. Kim picked me up exactly at 5 pm with his 15 year old daughter and she remained the primary translator for the duration of the night. Mr. Kim lives in one of those tall-apartment-building-villages-with-big-numbers-on-the-side (If you are in Korea you know exactly what I am talking about.. for those of you who don’t know, I will get a picture soon). I have always wanted to go in one since I have seen them all across Korea, and I have accomplished on thing on my list (CHECK). The meal of the night: Bulgogi (Beef and Veggies cooked together)… DELICIOUS. Mr. Kim kept trying to get me to eat properly with the chopsticks by demonstrating how to use them and I kindly told him that the proper was is too difficult, and I am working on it. He offered me a fork. I politely declined and continued to eat with the chopsticks, the wrong way… somehow I manage to pick up food so it works. Mr. Kim’s 15 year old daughter (wish I could remember her name) attempted to show me how to pick up kim (seaweed maybe?) and roll my rice in it. I don’t know what it is but it tasted delicious. I ate and ate and they kept giving me more and more. I had to tell them to stop I was getting so full. By time I got home and into bed, I was asleep by 9 pm. 11 am: Finally decide to roll out of bed and make myself some breakfast: omelet, toast, banana and orange juice…. delicious. I really need to find some regular pancake mix soon so I can have more food options. 3 pm: I live right near downtown Cheongju so we crossed the bridge and I showed her where the six corners market was (cannot remember the name in Korean). We saw a lot of fresh fish and pig heads (EEK!). I promise to go back and take and pictures. Then we walked out of the market and stumbled upon the downtown shopping area…. I can foresee this area causing my pockets a lot of damage… while all of the other foreigners will be getting drunk on weekends, I will be shopping…d(>w<)b ahhh so excited… less than 10 minutes from my house = shoppers paradise!!!! I felt like I was back in Seoul again.. well almost. 6:45 pm: Hopped across the stones on the Musim stream with Kiran. I told her not to fall in because the water looked a little dirty. I hoped I didn’t fall in either. 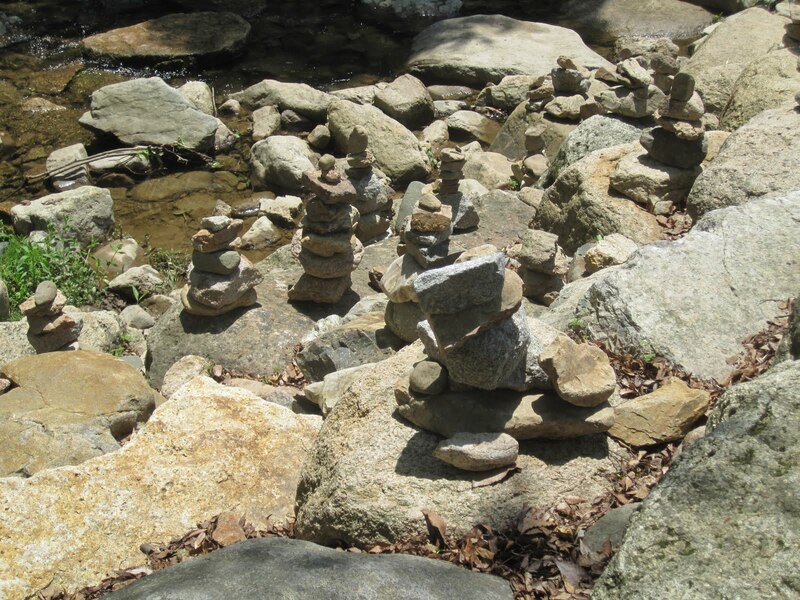 We hopped across the stones safely and reached land…. I’ve never felt so happy to be on land in my life. Tomorrow I actually start classes! I cannot wait to see what the kiddies have to say!! !